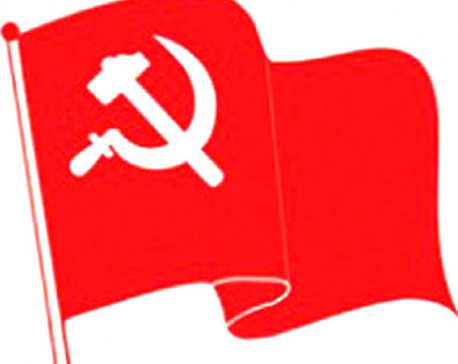 KATHMANDU, May 24: It may be just a coincidence or a changing trend. Most ministers in the incumbent government including Prime Minister KP Oli himself are found to have property mainly in the names of their spouses. This came to light Wednesday when the Office of the Prime Minister and Council of Ministers made public the property details of the prime minister and his cabinet colleagues. Prime Minister Oli, for instance, has all his property in his wife Radhika Shakya’s nake, except for Rs 4.2 million in his bank account. Two three-story buildings in Bhaktapur, a small piece of land in Jhapa, Rs 1 million in a saving account and Rs 2.5 million worth of shares in various financial institutions are also in Radhika’s name. Minister for Physical Infrastructure and Transportation Raghubir Mahaseth, who is found to be the richest in the Oli cabinet, has Rs 400 million worth of shares of various banks and financial institutions, all in the name of his spouse Julee Kumari Mahato. His lawmaker wife also owns two houses in Lalitpur and Dhanusha and huge tracts of land in Dhanusha, Lalitpur and Sindhuli districts. Almost half the total of 52 tola (606 grams) gold and Rs 7.2 million in savings accounts are also in Julee’ name. Mahaseth himself has only two pieces of land in his name in Dhanusha, a small amount of gold and Rs 10 million in bank loan. Experts say the main reason behind ministerial property being in the names of spouses is the incentive given by the government for property ownership by women. The government, for instance, provides some waiver in tax if land is bought in the name of a woman. Oli and Mahaseth are just two examples. Other ministers in the current cabinet seem to have followed the same trend. Minister for Law and Justice Sher Bahadur Tamang has most of his property in the name of his spouse Ushakala Rai, who is a lawmaker also. Rai owns a house in Kathmandu and plots of land in 11 various places in Morang and Khotang districts. 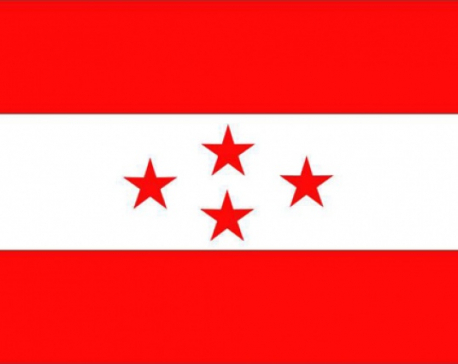 Tamang has four plots in Sindhupalchowk and Kathmandu in his own name. He also has loans totalling Rs 7 million and Rs 1.5 million worth of shares in various financial institutions. Minister for Defense Ishwar Pokhrel has all his property in his spouse Mira’s name except for a plot of ancestral land in Jhapa and Rs 700,000 in a bank. Mira owns a house in Kathmandu, land in Nagarkot and Dhading, cash in various banks and shares of various banks and hydro-power companies. Home Minister Ram Bahadur Thapa doesn’t have any property in his name except for a car provided by his party. His spouse Nainakala Thapa, however, owns a house and land in Chitwan and shares in various hydro-power companies including Upper Tamakoshi. Minister for Industry Matrika Yadav has Rs 69,000 in savings while his spouse Pramila Devi owns two houses in Siraha and Dhanusa, land in six different places and also some money in a savings account. Drinking Water Minister Bina Magar doesn’t have any property except for 58 grams of gold, while there is a plot of land in Chitwan in the name of her late spouse Prakash Dahal. Foreign Affairs Minister Pradeep Kumar Gyawali has a house in his spouse Saraswati Aryal’s name in Kathmandu, and Rs 259,000 in the bank and Rs 1.4 million in loan in his own name. Finance Minister Yubaraj Khatiwada and his spouse Kamala have Rs 15 million in various banks and one house each in Kathmandu. The Khatiwadas have almost equal amounts of property including land and savings. Culture, Tourism and Civil Aviation Minister Rabindra Adhikari is the sole minister with property in his own name and that of his parents, name instead of his spouse. He has houses in Pokhara, another one in Kathmandu and 700 grams of gold as ancestral property. Youth and Sports Minister Jagat Bahadur Bishwakarma has over 50 tola (583 grams) of gold jointly owned with his wife Anju. Similarly, Biswakarma has Rs 1.3 million in savings and his wife Rs 700,000. Minister for Labor and Employment Gokarna Bista’s wife Pratima owns a house in Kathmandu, about Rs 500,000 in savings and over 300 shares in various banks. Bista has mentioned that he has land and a house in Gulmi district as ancestral property. Federal Affairs and General Administration Minister Lal Babu Pandit’s wife Bimala has Rs 3 million in savings and a plot of land in Kathmandu while Pandit has Rs 2.5 million in savings, a house in Biratnagar and land in Biratnagar and Sarlahi in his own name. Energy Minister Barsha Man Pun owns a house and land in Rolpa as joint family property, 174 grams of gold and Rs 700,000 in his name. Forest Minister Shakti Bahadur Basnet has Rs 1.5 million in a savings account. He hasn’t mentioned property owned by his wife. Yama Banjade, the wife of Land Reform Minister Chakrapani Khanal, owns 12 kattha of land in Kapilvastu and more property in Rupandehi. But Khanal himself has just one kattha in Kapilvastu. He has Rs 1.7 million worth of shares while his spouse has six million in a savings account. Women, Children and Social Welfare Minister Tham Maya Thapa has the least amount of property among the 18 cabinet ministers and four state ministers. Thapa has a House in Beni, gifted to her from her mother, 10 grams of gold and Rs 15,000 in savings. 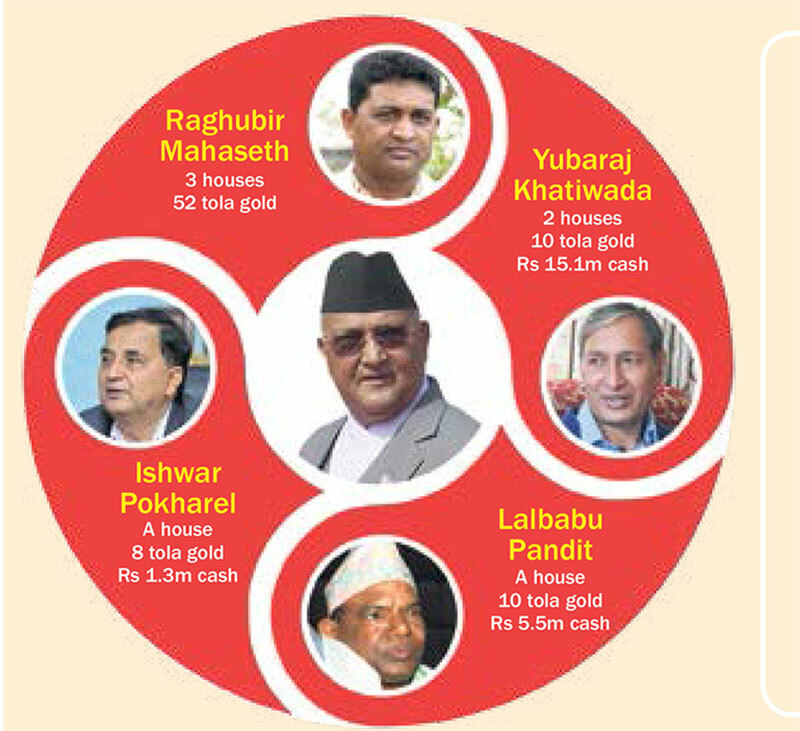 Education Minister Girirajmani Pokhrel also has a low amount of property compared to the others. He has an ancestral home in Khotang, Rs 400,000 in savings and Rs 5,000 in shares in a radio station.